The European Transport Research Alliance is the culmination of a process to bring together different transport research stakeholders and create the cooperation and integration of European transport research that is a necessary pre-requisite on the road to the creation of the common European research space known as the European Research Area - ERA. The ETRA initiative is supported by the European Commission and its creation came as a result of the preparatory work done under an EU-funded project, DETRA (Developing the European Transport Research Alliance), coordinated by FEHRL. and Other related initiatives as necessary. The new organization complements the existing structures for transport research and innovation provision in Europe by bringing a multi-modal and research-led forum which will contribute to important debates on the future of European transport. 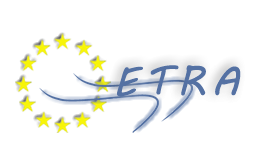 The European Conference of Transport Research Institutes (ECTRI) was founded as a non-profit organization under the French law on January 2003. Prof. G. Giannopoulos was elected as its first Director for the years 2003-2005 and was re-elected for the years 2005-2007. In January 2003, HIT's Director, Prof. G.A. Giannopoulos was elected President of ECTRI for the period 2003-2005 and in March 2005 was reelected for the period 2005-2007. To actively promote cooperation in the field of surface transport and participate in the creation of the European Research Area (ERA). To participate in the integration of the European Research Area by preparing networks of excellence. To stimulate and facilitate the participation of its members in European R&D projects in the field of transport. In the long term ECTRI will develop a European Network of Excellence (NOE), in a broader sense than the NOEs of the 6th FRDP but in line with the concept developed by the European Commission, where integration and common activities are dynamic. ECTRI is already working towards setting up a European Certification Laboratory in the field of Advanced Driver-Vehicle Systems by utilizing the infrastructure of all its members. The South East European Transport Research Forum (SETREF) is an international non-governmental non-profit association of organizations in South East European countries devoted to the promotion of transport research and education. Its scope covers all forms of transport activity, i.e. planning, evaluation, design, construction and operation of the transport systems and all transport modes (road, rail, air, maritime, and inland waterways). SETREF was established in Thessaloniki, Greece, on April 1997. Its offices are in Thessaloniki within the building of HIT. SETREF has today 33 organizations members, with most of which HIT retains close relationships (see Table below). SETREF's objective covers a wide range of activities in the field of transports, such as that of the evaluation, planning, construction and operation of the transportation system in all types (road, rail, air and maritime). Promote exchange of research personnel. Its focus area is S.E. Europe but its activities extend to all Eastern European and Black Sea Countries. Prof. G. Giannopoulos has been President of SETREF for the first seven (7) years of its operation (1997-2004). The European Road Transport Telematics Implementation Co-ordination Organization (ERTICO) is a European, non-profit organization. It was founded on 1991, following an initiative by the European Community and National governments. Its shareholders are public and private organisations. Its mission is the promotion and development of Intelligent Transport Systems and Services (ITS), ensuring sustainable mobility, transport quality and increased profits. By joining ERTICO member companies and organisations can achieve significant trans-market or trans-national partnerships with the ultimate goal of forming a successful CERTH became on 2003 the first Greek member-shareholder of ERTICO. The Forum of European Road Safety Research Institutes (FERSI) was created in 1991 to bring together the national research organizations to provide a common focus for road safety research at the European level. FERSI's mission include the promotion of the research cooperation for finding a solution to the common road safety problems in European countries, the provision of support services to the EU for the determination of research needs in Europe, the promotion of information exchange, best practices and partners as well as the cooperation between the involved countries. The Forum activities include the carrying out of research projects for the EU and other international organizations, the provision of advice on road safety research matters to national governments and European institutions, the promotion and support of relevant conference and seminars, the establishment and maintenance of strong links with national and international clients for road safety research as well as with other worldwide bodies with a responsibility for road safety research and implementation. HIT became a member of FERSI in 2004.